Order your Audio-Technica AT831CT4 Lavalier Condenser Mic For Shure Wireless TA4F from AMS and enjoy 0% Interest Payment Plans, Free Shipping, Free Extended Warranty & 45 Day Money Back Guarantee. 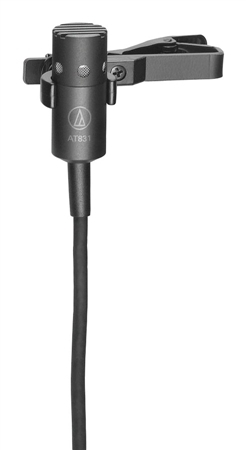 The Audio Technica AT831cT4 Condenser Lavalier Microphone provides crisp, full-sounding voice pickup. Terminated for Shure wireless systems using a TA4F type connector. The mic is ideal for higher SPL applications with excellent gain before feedback and suppression of background noise. 55 inch (1.4 m) cable. Includes windscreen and clothing clip.